Blue Jays are fun birds. Members of the Corvidae family, they are smart and bold. Yes, they can seem a little obnoxious to human eyes, but if you watch them, they don’t so much bully other birds at the feeders as behave in a loud self-important “me first” way. They fly in, take what they want, announcing it with loud calls, and then move on to other business. And sometimes other backyard birds call their bluff and they are the ones who have to back off! Would you like Blue Jays in your yard? Offer them the foods they like! 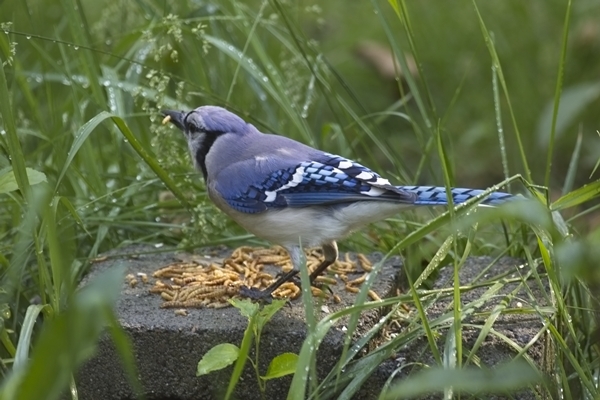 In my yard, Blue Jays seem to like four things from the feeders: sunflower seeds, dried mealworms, suet and PEANUTS. They LOVE peanuts. I put out three large handfuls of peanuts (in the shell) every day in a hanging tray feeder on a shepherd’s hook pole. 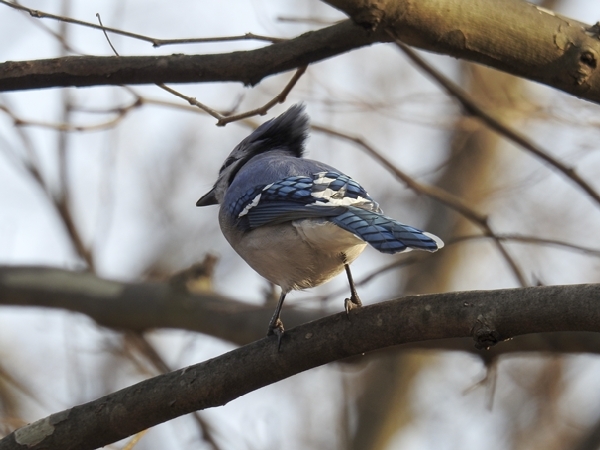 When one of the local Blue Jays spots that the peanuts are out, he or she lands on a branch overlooking the feeder and calls very loudly for a minute or so, announcing to the local world that something good is to be found here. Then the jay will swoop down to the feeder to pick out the best peanut. He will pick up one peanut in his beak, seemingly to judge the weight and size of it, put it down and check out a few more until one that suits him is found. Then he’ll fly off to land high in a nearby tree to break it open to eat. If the peanuts aren’t too big, he might even get a couple of peanuts at once, stuffing one down into his throat pouch and then taking a second one in his beak. 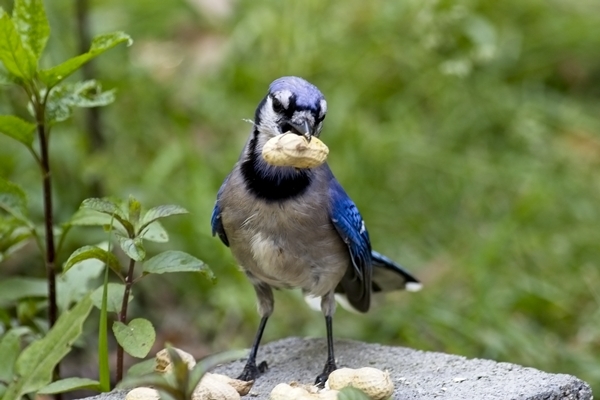 The jays don’t only eat the peanuts immediately; they also cache some for later. 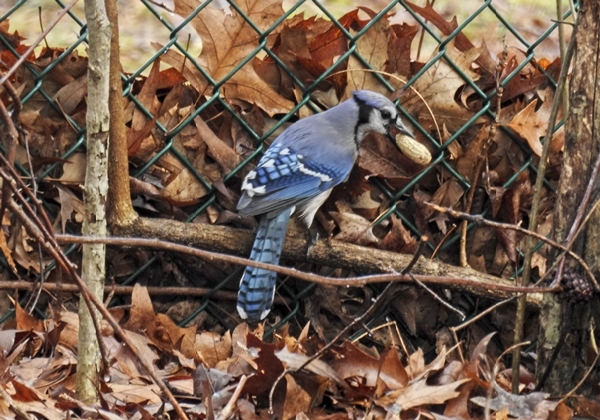 I once watched a jay go straight from a feeder to cache peanuts in leaves that had blown up against the base of a chain-linked fence, a site that didn’t seem all that secure to me in a yard full of squirrels. 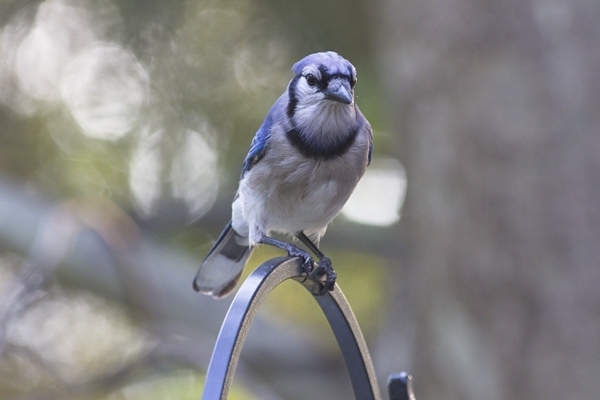 In our yard, there is typically a family of five to seven Blue Jays that usually descend on the feeders together. While there is often some jockeying, mostly they do take turns, pacing themselves like planes on a runway waiting for their time to land. They keep coming back, keeping up their calls, until all the peanuts are gone. Once the peanuts are depleted, one or two jays will sometimes eat a few dried mealworms that get mixed in with the safflower on this feeder. They might eat a few safflower seeds but it doesn’t seem to be a favorite. But in general once the peanuts are gone, they fly off to patrol the neighborhood, looking for other food, mobbing Coopers Hawks, American Crows and Fish Crows, circling back periodically to see if there is anything new at the feeders. My strategy with the peanuts is to put them out once a day in one feeder and not have a constant supply available. I do this because the Blue Jays are pretty loud and disruptive when they descend on the feeders to eat and all the other birds temporarily back off. They seem to know that the jays will only be doing this for about ten minutes and then the feeders will settle back to normal so they don’t usually go far. This is the feeder that I use to feed peanuts and mealworms to the Blue Jays. It is a hanging tray type feeder from Birds Choice. 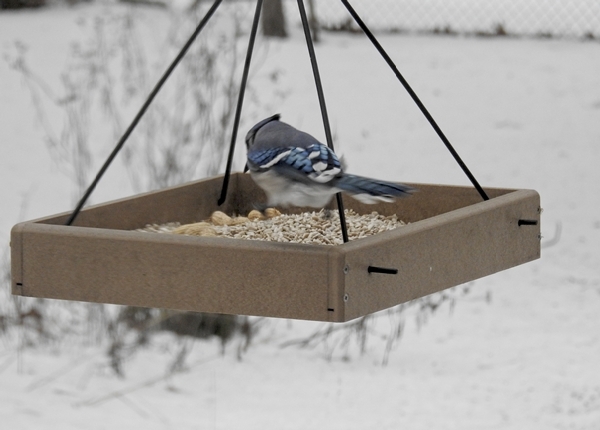 (I reviewed it here if you are interested..) This feeder is nice for this purpose because its openness lets the jays easily fly in and out; they can grab their treats and go efficiently. It’s large enough that two or even three of them can grab a peanut at once (although that can sometimes lead to some bickering.) I used to hang it on a tree limb, but that is just inviting squirrels to the buffet, so now it hangs on a pole out of squirrel jumping range with a squirrel baffle on the pole. The disk baffle over it really serves as more of a rain guard in this set up. The seed can still get wet if it rains hard or there is heavy snow, but mostly it works great for the jays and quite a few other bird species. 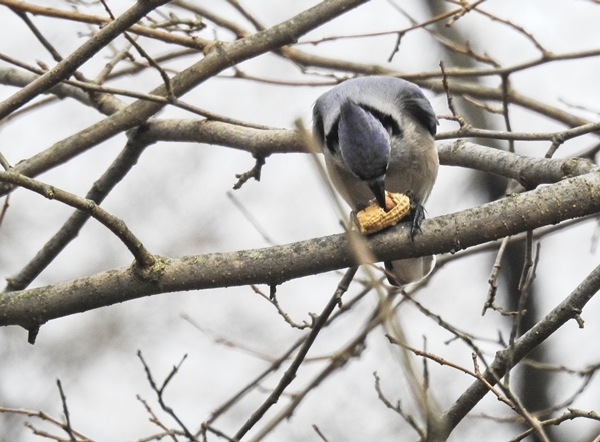 In the spring, the local Blue Jays come to the suet feeders quite a lot. The suet feeders I’m using now are the upside-down type feeders that woodpeckers and other clinging birds like, but that are a little more difficult for birds like European Starlings to feed from and dominate. Other birds in the yard, including the Blue Jays, have figured out how to cling temporarily from the grid underside of these feeders to get beak fulls of suet. Because they do this in the spring, I think they probably feed it to their young. 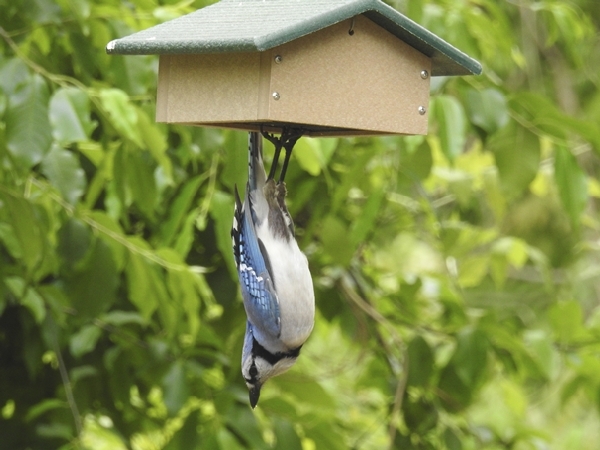 Keep in mind that like most birds, Blue Jays don’t get all of their food from feeders. They also really like acorns (which are abundant in my wooded yard) and other seeds and grains they find in nature. They do also seem to appreciate the birdbaths in the yard. I keep two of my birdbaths heated in the winter so even when there are no peanuts currently available, a Blue Jay might still stop by for a quick drink. I like the Blue Jays. They are bold and brassy and completely full of themselves. But they are also the feathered cops of the neighborhood. They warn the other birds when there is a predator around and will mob hawks and crows aggressively which I think evens the playing field a bit for the backyard birds in general. I think they can recognize people too. I think they know I’m the one that puts out the peanuts and watch my movements in the yard. Sometimes if I walk out the back door, a jay will call out, I think hopeful that the peanuts are coming. 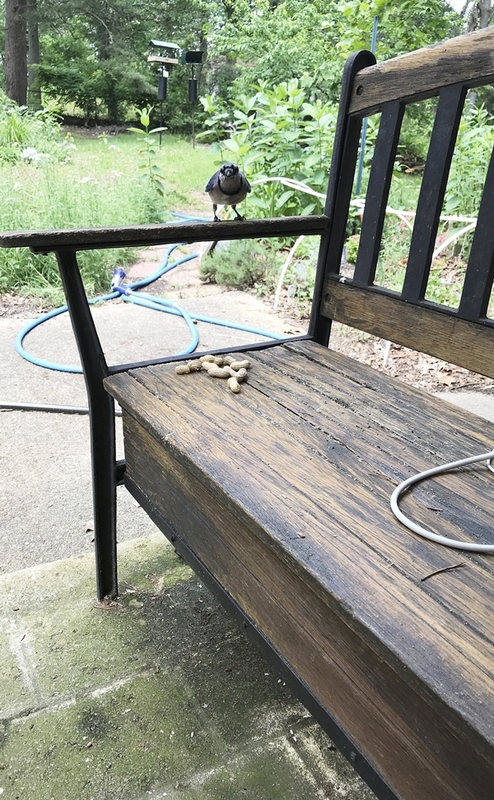 Sometimes, when the weather is warmer, I’ll sit on the back step and put peanuts on the ground or on a bench a few feet away from me. One bold Blue Jay will come up and quickly grab a peanut and fly off. This is repeated several times. I’m not sure if it is the same jay over and over or a series of jays, each taking their turn like they do at the feeders although I suspect it may just be one that is brave enough (or hungry enough) to take the chance. 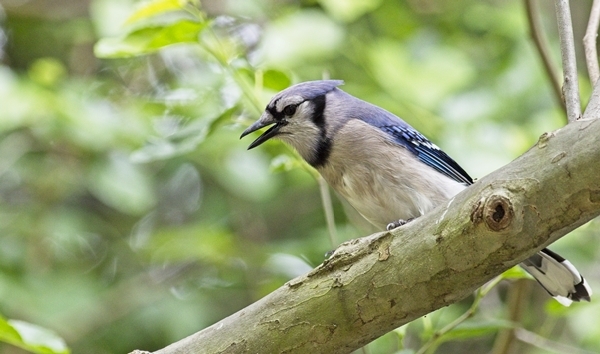 Want Blue Jays in your yard? Try offering peanuts. I suspect they will love you for it. Want to learn more about Blue Jays? 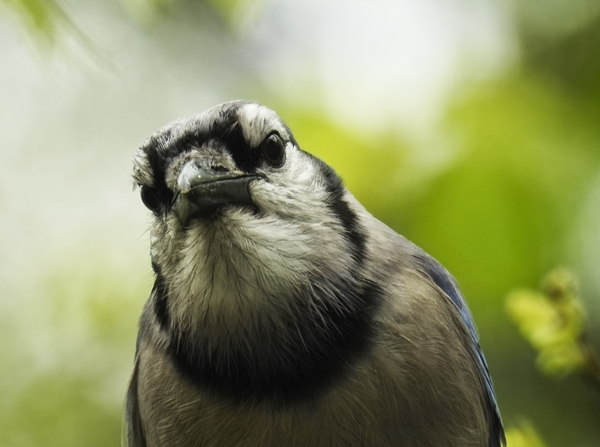 Check out All About Birds’ Blue Jay Pages.